I'm in a diet regimen today and discovered online about afterburn effect while searching for a better way to loose weight and gain some muscles after an effective raw food diet that made me lose 5 pounds in 19 days. Afterburn is "claimed to be" a revolutionary way to loose some excess fats in the body. According to a video I just watched, this series of exercise regimen just needs to accomplish in just minutes a day plus all you need is get 7 out of the list to become your most favorite and will do everyday in the comfort of your own home. Just imagine a few minutes is all it takes according to the promise and there is also a guarantee? To a certain Mike Chang, it is a series of exercises targeted at losing fat in the fat cells by triggering Leptin, T3 and T4 (if i'm not mistaken). Is it really effective? I mean 1+1=2 so how come the promised results? Shying away some of the best personal trainers there are even in Hollywood? How could this guy expect me to believe something that defies even simple math? Less exercise will only mean little results and there is even no need for common sense here. Anyway, what I did was to make a comprehensive research at what people have experienced and the opinion of other experts and non-experts with high value in common sense. Fact: Exercise takes effect immediately and how the body responds to it is still a mystery but there are certain definite measurements with which we can base the results whether we lost weight or not by simply making track of the weight. According to a Google ad that says loose weight using some odd tips from a certain Mike Chang with his body dangling all over the ad clearly saying he did it with just a few exercise. I say it's full of *hit simply because that body is clearly contoured to what it looks like using not just some exercise. Although it doesn't say it is, I know and we all know and could easily comprehend with it. So what I did was to go visit the link. Watched the bat-*hit video and listened carefully as the guy every now and then say he will soon reveal the routine exercises. Yeah he did! He did reveal it using just another lure to click and buy the regimen in a series of CDs. I know it but before I get led to the buying spree, I opted out. The promise was delivered... Just not the right one - free video on how to do the afterburn exercise and series of exercises are included on it. You will have to buy the CDs first to see it all... hahaha! I took time to get the research and found out what other people have to say about losing body fat convincingly to gaining some body muscles in mass. Below are some comments and reviews about afterburn effect and it's all up to you to believe it or not. "Exercise is a poor way to try to lose fat anyway as you can see if you read the following fitness facts. • It is not necessary to do "cardio" to burn fat. Cardio is aerobic exercise while maintaining a heart rate of 80% of max or more which is used to maintain cardio-vascular fitness. You can burn fat in your sleep. • An average natural bodybuilder who is just starting to train may gain as much as 4-8 ounces of muscle in a month. An average dieter who is burning fat will lose about a pound a week. Anyone can gain a pound in a few minutes just be drinking a pint of water." Here is also a context of ideas (review) you might want to read so you know how much to expect from this afterburn effect exercises from a PhD Dr. Christopher Scott. Here is where the interview was revealed through www.builtlean.com written by Mark Perry. That interview is definitely worth the read and you will learn a lot about some facts and figures understanding afterburn's effectiveness when incorporated in our life. This will serve as your arm before buying any exercise regimen that promises guaranteed results in any deceiving way or so. 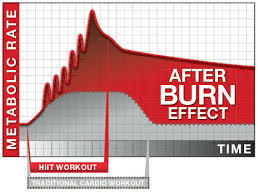 Understanding the link that took me to the page where a review of afterburn effect details the whole process to the accomplishments to expect by comparing an anaerobic with aerobic exercise attaining afterburn during and after and how the principle of oxygen with which the whole idea of the effect is actually centered is explained in a comprehensive manner. You can find the review article here. There were claims widespread all over the internet that this system actually takes people to continually lose weight even after a series of calorie-burning easy exercise cheats. Yes, even after workout. I say I laughed at it out loud simply because we all know that during and eventually after every exercise we do, we tend to lose weight depending upon the metabolism of our body. The more sweat, the more weight loss. Take for example boxers, how do these guys lose weight when they become overweight during a weigh-in before a fight? Get it? We don't have to do a research on this at all. It's all about common sense - Lose liquid and lose weight and we don't even need to understand what afterburn effect is all about. Fact is, we lose by sweating and we lose wight hoping some toxin goes with the sweat including the fats stored in fat cells inside our body. So what's there to explain? One thing for sure, diet, exercise, body condition and metabolism will absolutely play the biggest role in losing weight. We can't just expect to have 6-pack abs by doing simple series of exercises stated in the afterburn effect regimen. We have to work out and yes, sometimes it had to be hard ones. For a tip, do a raw food diet and you'll definitely be amazed at what changes will occur to both the mind, body and soul. I did it for 19 days and I lost 5 pounds on a gradual slow but sure basis. It's proven and I don't even need to put here any explanation. Why do I need to anyway? Is eating healthy fresh raw salad bad for health? If not, then what's wrong with going through with it? We all know too much exercise can lead to burnout body and exhaustion so, we do it moderately, on timing and on a managed duration or time frame. Good luck to all in their afterburn effect workout!